VS 2010 includes new support for better managing debugger breakpoints. One particularly useful feature is called “Breakpoint Labels” – it enables much better grouping and filtering of breakpoints within a project or across a solution. With previous releases of Visual Studio you had to manage each debugger breakpoint as a separate item. Managing each breakpoint separately can be a pain with large projects and for cases when you want to maintain "logical groups" of breakpoints that you turn on/off depending on what you are debugging. 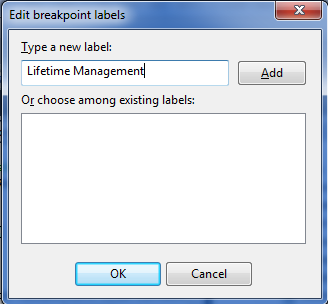 Using the new VS 2010 "breakpoint labeling" feature you can now name these "groups" of breakpoints and manage them as a unit. The first and last breakpoint in the list above breaks into the debugger when a Controller instance is created or released by the ASP.NET MVC Framework. VS 2010 now supports importing/exporting breakpoints to XML files – which you can then pass off to another developer, attach to a bug report, or simply re-load later. Above I’ve filtered my breakpoint list to only export two particular breakpoints (specific to a bug that I’m chasing down). I can export these breakpoints to an XML file and then attach it to a bug report or email – which will enable another developer to easily setup the debugger in the correct state to investigate it on a separate machine. Visual Studio 2010 also includes some nice new “DataTip pinning” features that enable you to better see and track variable and expression values when in the debugger. You can “pin” any number of DataTips you want onto the screen. In addition to pinning top-level variables, you can also drill into the sub-properties on variables and pin them as well. Below I’ve “pinned” three variables: “category”, “Request.RawUrl” and “Request.LogonUserIdentity.Name”. Note that these last two variable are sub-properties of the “Request” object. Pinned DataTips can be used across multiple debugger sessions. This means that if you stop the debugger, make a code change, and then recompile and start a new debug session - any pinned DataTips will still be there, along with any comments you associate with them. 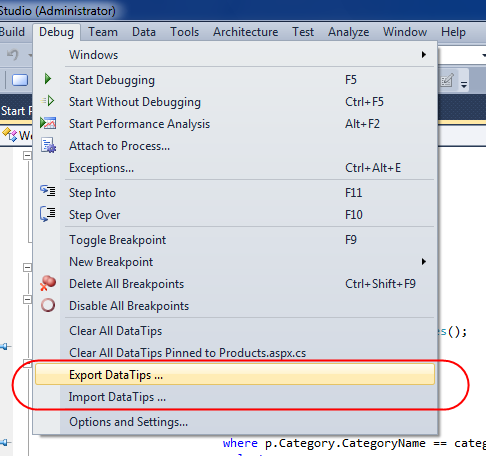 Pinned DataTips can also be used across multiple Visual Studio sessions. This means that if you close your project, shutdown Visual Studio, and then later open the project up again – any pinned DataTips will still be there, along with any comments you associate with them. $#@! – what was the value of that variable again??? One of the nice things about pinned DataTips is that they keep track of their “last value from debug session” – and you can look these values up within the VB/C# code editor even when the debugger is no longer running. This makes it much easier to keep track of state and conditions as you toggle between code editing mode and debugging mode on your projects. 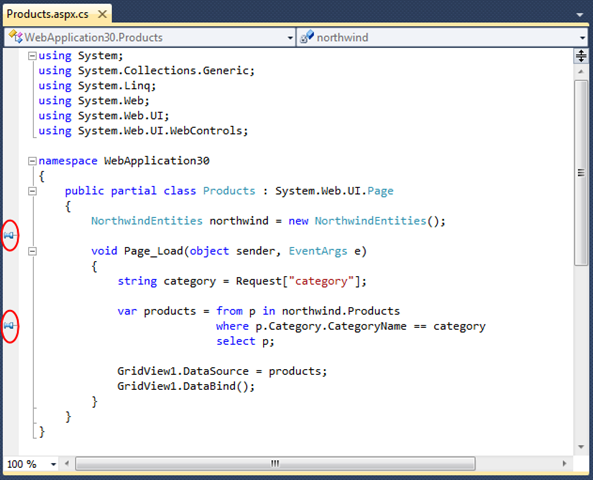 Visual Studio 2010 includes a bunch of great new debugger features – both big and small. I’ll be covering some of the “big big” new debugging features like Intellitrace, parallel/multithreaded debugging, and dump file analysis in future blog posts.